What are the best Softball & Baseball Cleats for Catchers on the market? There are various popular brands that manufacture baseball cleats, and they’re trusted brands. But, when it comes purchasing catchers cleats, you need to check a lot more than just brand name. 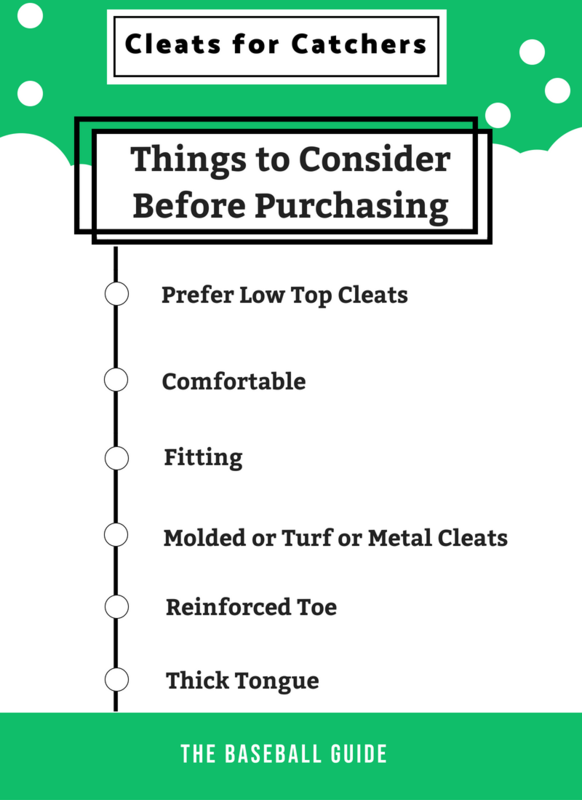 In the below, I’ve discussed a few things that’ll help you to decide which pair of cleats you should choose. How Much Ankle Support You Need? Can You Squat in your Cleats? For baseball catchers, my personal choice is New Balance because their cleats are perfect for the baseball players. The baseball catchers need a pair of cleats that contains toe protection because they have to bend a lot that puts a lot of pressure on the front area of their cleats. Along with that, their cleats should be comfortable and provide good grip on the surface. By considering all the things, I will recommend New Balance Cleats because they have all the things that you need. If you want metal cleats, then I’ll go with New Balance L4040v3 Cleats. For molded cleats, try New Balance 4040v4 Cleats. While if you want shoes for turf ground, then New Balance TY4040 Shoes are good for you. How much ankle support you’ll get depends on what type of cleats you’re wearing. The low top cleats do not provide ankle support. They are not for ankle support, they are lightweight and built for speed. The mid top cleats provide some amount of ankle support. Along with that, they are slightly heavy as compared to the low tops. However, if the ankle support is the priority, then high top cleats are the best. They are designed for this purpose in mind. Now, when it comes to baseball catchers, they should have mobile ankles. The mobility of ankles helps a catcher to get into the perfect position of catching a pitch. For that, low top or mid top cleats can be a good option. Another thing that needs to be considered is that most catchers do not need to run. Sometimes, a catcher has to take initiative and run towards the baseball to catch it. Just like these super catchers. But, in most of the cases, the catcher serves behind the hitter in the squatting down position. So, if you neglect the rare cases, where you have to take a quick run, the most comfortable cleats you should buy. If you require ankle support, then go with high tops or mid tops. If not, then low tops are the good option. Whether you are a softball catcher or a baseball catcher, you need to be in squatting down position a lot. Can I squat in these cleats? The best thing is to take your catching position by wearing your newly purchased cleats. If you are not comfortable in them, then they are not a good fit for you. The high top cleats provide good ankle support, but if you prefer high tops, then make sure they’re comfortable. The high tops cover the ankles, so, when you squat down, then the cleats can be uncomfortable around the ankles. It depends upon the player to player, but at least think about it before making your final purchase. Sometimes, just replacing the insole of your cleats makes them very comfortable. It is not something that is necessary to buy. If you are comfortable in your cleats, then there is no need for insoles. 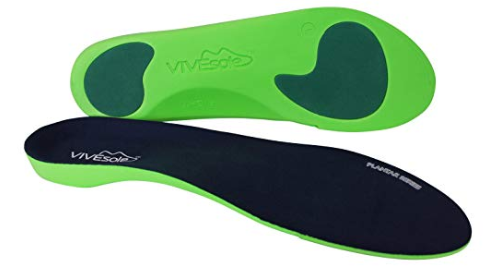 But, for some catchers who have flat feet or high arches, just replacing the insoles can be a lot helpful. It happens with some players whether they play baseball, softball, soccer or football, they don’t find a comfortable pair of cleats. They move from one brand to another, but later they find that they just need the right type of insoles. If your cleats are not a proper fit for your feet, then you need to change them. When buying your catcher’s cleats, make sure they have some amount of wiggle room for your toes. If you buy cleats in which your toes are touching the front area of the cleats or they’re tight, then they’ll not be comfortable when you’ll be in the catching position. In the catching position, you’re on your forefeet, and it forces your forefoot in the forward direction. So, tight cleats can be uncomfortable for you. But, buying loose cleats just for some wiggle room is not recommended. As you wear them, and you break them in, they’re going to expand a little. One thing you should consider is whether you need wide cleats or not. If you have flat feet or wide feet, then buying a wide pair of cleats can be a good option for you. There are many baseball cleats manufacturers that give the freedom to choose from standard width or wide width cleats. When they’re in the catching position, they put a lot of pressure on the toe area of their cleats. Therefore, before buying our catching cleats, make sure they have toe protection or toe reinforcement. The toe reinforcement helps the cleats to last longer and protects the front part of the cleats from getting damaged. The cleats made of genuine leather are much more expensive as compared to the cleats made of synthetic leather. But, genuine leather cleats are also more durable, breathable, and offer superior quality. If you are playing at a professional level or if you can afford genuine leather cleats, then go ahead buy one. But, in the little leagues and high school baseball, most of the players wear synthetic cleats. The thick tongue makes the cleats more comfortable. For the baseball catcher, the tongue of the cleats is an important thing to consider. As they are more in the squatting position, so having a comfortable tongue makes the whole cleats comfortable. 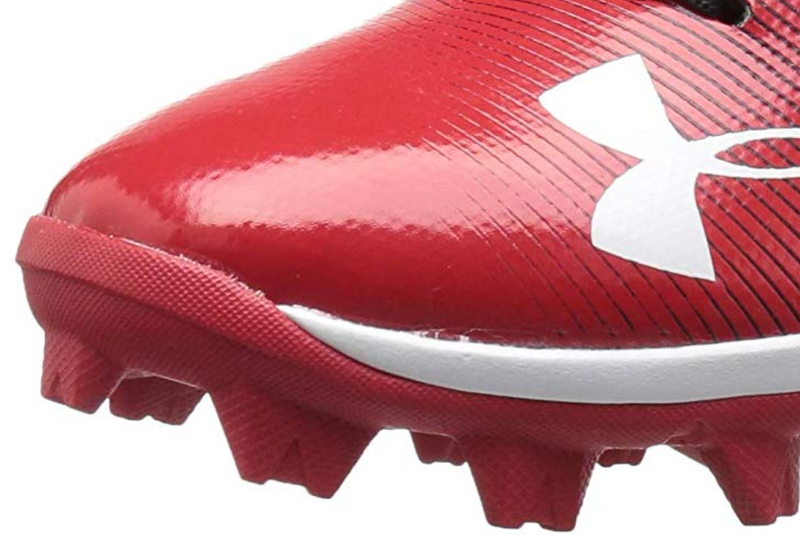 The metal cleats provide more grip on the surface. For the baseball catchers, metal cleats are good but they’re not necessary. In most of the cases, the catcher only has to stay in his position. The catchers do not require a high level of grip which is provided by metal cleats. But, the grip & traction should not be ignored at all because catchers need a certain amount of grip to stay in position. For that, metal cleats is a good option. If for some reason, you don’t want metal cleats or your league doesn’t allow metal cleats, then molded cleats is the alternative. Molded cleats provide a good grip on the ground, the only difference is that they have rubber spikes instead of metal spikes. If you are playing on the artificial turf ground or just doing practice, then you should go with the turf shoes. There are many e-commerce stores from where you can buy your catching cleats. But, make sure, they’re good in returning and refunding because cleats, especially for the catchers, need to be very comfortable around ankles and in feet. So, if you are not fully comfortable, then return and try another. Personally, for the baseball & softball catchers, I’ll recommend New Balance Cleats. I have to admit that I’m a fan of New Balance. For catchers who love metal cleats, for them, I’ll also like New Balance Men’s L3000v3 Metal Cleats. However, if you like to go with molded cleats, then New Balance PL4040v4 Molded Shoes is a good choice. If you like turf shoes, then New Balance 3000v4 Turf Shoes is an option. Why New Balance Cleats are Good for Catchers? The New Balance Cleats are comfortable, stylish, affordable, toe protection and provides a good grip on the field. But, there is nothing impressive here. Other brands like Nike, Under Armour, and Mizuno also manufacture cleats that have all of these qualities. What makes the New Balance Cleats different from others? Everyone does not have standard feet. There are a lot of players who have narrow feet, wide feet, and flat feet. Buying a standard size cleats is not a comfortable option for them. So, one of the best thing that New Balance offers is the freedom to choose cleats with different widths. You can find New Balance cleats in standard width, wide width, and extra wide width. Such freedom is not available in other brands. Due to this, their cleats become much more comfortable than cleats of any other brand. So, with such custom width options, New Balance is helping thousands of its users to give them a perfect fit that drastically improves their performance in the game. For the baseball pitchers, NB L3000v3 Cleats are one of the best metal cleats. The strategically designed 8-Spike Configuration provides you the optimum grip whether you’re in the catching position or running to catch a flying baseball. I highly recommend these metals, and you should definitely take a look at the customer reviews of NB L3000v3 Metal Cleats. If you are not buying metal cleats, then molded cleats is a good alternative. For that, I’ll go with New Balance PL4040v4 Molded Cleats. They’re lightweight as compared to the metal cleats. If you are thinking about purchasing any other cleats, then before that you should take a look at the customer reviews of NB PL4040v4 Cleats. For the casual practice session, turf shoes are the best. To be more specific, NB 3000v4 Turf Shoes are the best. Along with the different colors, design, comfort, they’re lightweight and you can choose your preferred width of the cleats. If you like them, then you will notice that they’re also very affordable. Take a look at the price of New Balance 3000v4 Turf Shoes. These baseball cleats are manufactured by Under Armour which is one of the most popular brands in the Baseball market. These cleats are made with synthetic leather, and they’re very comfortable. To increase the breathability of your shoes, mesh tongue is there. It also ensures that your feet remain cool and dry during the whole game. The full-length EVA midsole and proper cushioning is present in these cleats that make them very comfortable and evenly distributes the pressure on your feet. These are rubber molded cleats that provide optimum traction and grip on all types of fields. If you are looking for the metal cleats, then you need to look at other pairs of metal cleats. As the baseball catchers stay on their position in such a way that it puts a lot of pressure on the toe area of the shoes. In that case, toe protect is there to balance all the pressure and increase the life of the cleats. They also offer all other features that you look in perfect cleats. If you don’t like New Balance Cleats, then you can also give them a try. Along with that, they’re also affordable and cost less than the New Balance cleats. It is one of the most recognizable brands in the world. If you catcher cleats that are manufactured by the top international sports brand, then go with Nike Cleats. To reduce the price of these cleats, synthetic leather is used in the manufacturing. If you want Nike metal cleats, then you may have to pay a slightly higher price than this one depending upon the model you buy. Carefully designed 12 solid rubber cleats give you perfect grip on the ground so you won’t lose grip and quickly gain speed. There are also various color options available that’ll match with any baseball team uniform, and they look really decent. The toe protect is also available that will help them to handle the stress on the toe area. As they’re manufactured by the top brand in the world, you don’t have to worry about the quality and durability of these cleats. But, as told earlier, my number one choice is New Balance, but if you want cleats that are made by some international brand, then these cleats you should buy. These are synthetic cleats that contain 9 strategically placed rubber spikes that provide maximum grip on the field. 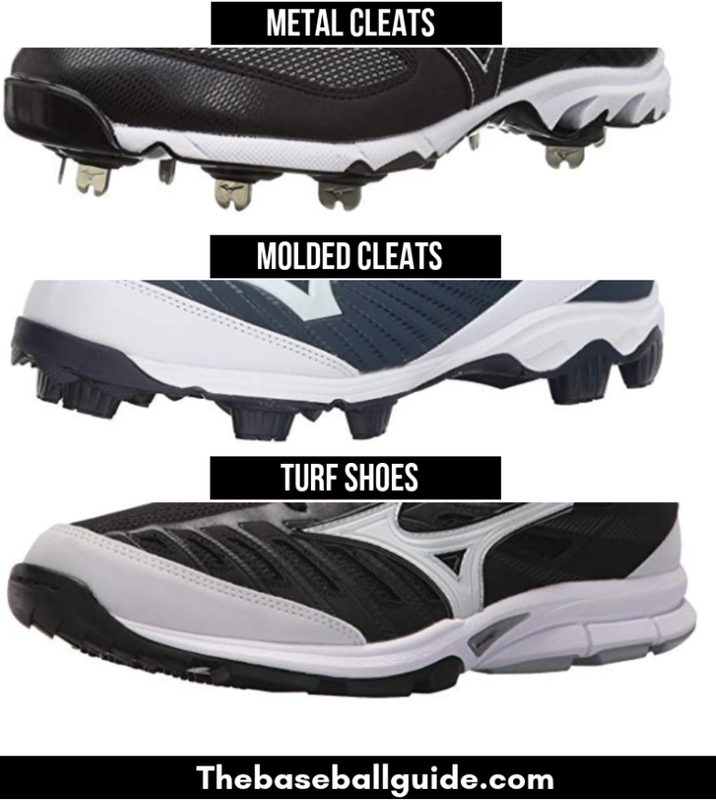 The 9-Spike is a successful design of Mizuno and it worked really well on the field, therefore, in a very short period of time, these cleats became very popular among young players. The padded tongue and full-length midsole provide a great level of comfort while you’re playing. In these cleats, the toe is protected that makes it durable. These imported baseball shoes are well-designed and contain synthetic sole. These are highly durable and comfortable. If you’re a catcher, then the toe area of your cleat is the most important part for you. In these cleats, you’ll get Adituff, which gives you the best abrasion resistance in the toe area. Adidas has installed Ortholite sock liner which provides a great cushion and it also works as resistance to odor. For the light-weight cushioning, full-length EVA midsole is installed in it. A light-weight thermoplastic polyurethane outsole is also present in it, which gives you enhanced performance and traction. These cleats are very suitable for catchers. So, in the above, I mentioned 3 catcher cleats that you can purchase. But, as I mentioned earlier, from all the available products, my personal favorite is New Balance 3000v3 Cleats. This is also one of my recommended baseball cleats for speed. I like them so much that, I also recommend them as the best pitcher cleats on the market, because pitcher and catcher have similar requirements like they both need low top cleats with toe reinforcement. I hope that you found some helpful information in this article. If you’ve any question, then feel free to ask in the comment section. Good info. Thanks for sharing! Would you also share the other models that you tried that did not make the cut? Yes, of course. I’ll share that info shortly.